Mutual fund results come from more than just the dividend yield. 2. How do I Find the Year to Date Return on a Mutual Fund? The return results from a mutual fund can be confusing compared to a fixed-income investment on which you know in advance the yield you will earn. The total return you receive from a mutual fund includes gains from several sources including the dividend yield. View the results from mutual funds in different terms, such as annual and total returns. A gain in your mutual fund account value can come from several sources. If the fund pays dividends, those dividends are the income paid by the fund. Dividends result from stock dividends or bond interest earned by the fund. The fund's share price can also increase, increasing the value of your investment. If a mutual fund generates profits from selling stocks or bonds it holds, those profits are paid out to investors in the form of capital gains distributions. All three parts -- dividends, capital gains distributions, and share price changes -- go into the total return from a mutual fund. The reported distribution yield of a mutual fund is the current dividend rate divided into the current share price. Because both the dividend amount and the fund share price will change with the fund's investment results, the current yield might not be an accurate indicator of your future return from the mutual fund. On a historic basis, your yield is the amount of dividends earned for the year divided into the account value at the beginning of the year. For example, on Jan. 1, your fund account was worth $10,000 and you earned $500 in dividends throughout the year. Your dividend yield for the past year was 5 percent. Your actual fund account value might be higher or lower than $10,500. The total return from a mutual fund investment is the ending value of your account minus the start value dividend by the start value, assuming dividends are reinvested. For example, your account started the year at $10,000 and ended the year worth $12,000. Your total return for the year was 20 percent. A portion of the return was the dividend yield, with the remainder from capital gains and/or a share price increase. If you take the dividends as cash, the dividend amount for the year must be added into the year-end value to compute the total return. 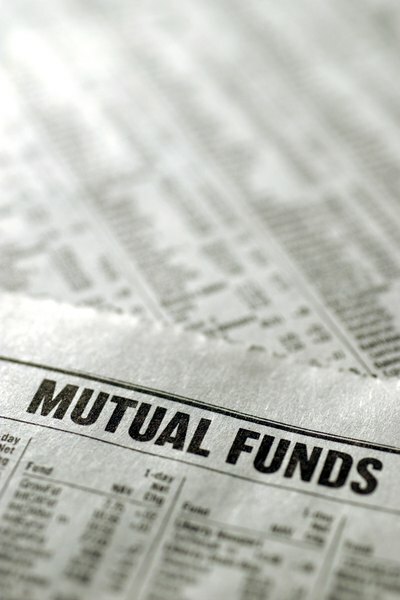 For multiyear periods, mutual funds report average annual returns. A fund will report the average return for the last 3, 5, 10 years and since the inception of the fund, depending on when the fund was launched. The average annual return is a compounded return. For example, if a fund reports a three-year average annual return of 10 percent, the three-year total return from the fund would be 33 percent, with the 10 percent compounding each year.